Rock Creek Park is not just a natural area. It’s also a travel corridor, a gathering place for major sporting events, and a place for hiking, biking, horseback riding, and more. The streams in the park are fed by stormwater runoff from the surrounding urban and suburban areas. These demands and uses present challenges to the park’s natural communities . The benefit of having a natural area like Rock Creek Park in the middle of a large city is that it’s within reach of so many people, providing each of them with a beautiful place to relax and recharge in nature. However, an urban location presents extra challenges in terms of keeping natural communities healthy. Some of the specific challenges facing Rock Creek Park’s natural communities include fire suppression, stormwater runoff, and structural manipulation of streams. Because the park is surrounded by people and development, any fires that start in the park must be quickly extinguished. While this is good for the park’s neighbors, it is not good for all of the park's natural communities. In the past, lightning undoubtedly started fires on the high, dry ridges in Rock Creek Park. Evidence suggests that Native Americans burned the forests for particular reasons, too (see Historic Water and Land Use). Because of the history of fire, the ridgetop areas of the park—Rock Creek Park's Dry Oak - Pine Forest Ecological System—are largely dominated by species well-adapted to fire. Mature chestnut oak, for instance, has thick bark that protects it from most fires. Mountain laurel is highly flammable due to the fact that its foliage and stems are high in natural oils, but it has the ability to sprout up again from the roots. Ecobit: Fire-Tolerant or Fire-Dependent? Fire historically weeded out fire-sensitive plants. After decades of fire suppression, however, fire-sensitive trees such as red maple and American beech are moving into the hilltop communities (the Chestnut Oak / Mountain Laurel Forest and the Mixed Oak / Heath Forest) of the park's Dry Oak - Pine Forest Ecological System. In some parks and natural areas, controlled burning is used to maintain natural communities such as these, but Rock Creek Park is too close to too many people and buildings to make that a safe option. In the past, occasional fire maintained openings in the forest in which meadow species grew. Meadows are important to a set of creatures (including butterflies) that don't thrive in forest settings. Today, regular mowing keeps meadows free of trees and shrubs so that wild grasses and other meadow plants can grow. The watershed of Rock Creek—that is, the area it drains—is 76.5 square miles, and much of that is covered by buildings, roads, and parking lots. When it rains, stormwater rushes off these impervious surfaces directly into storm drains and from there, directly into streams rather than soaking into the ground and replenishing the groundwater as it would naturally. Ecobit: Rain, Rain, Go Away—But Where? Stormwater runoff from the urban areas surrounding Rock Creek Park and the other park units it administers creates many challenges for streams and natural communities, including pollution, increased erosion, and decreased groundwater. Pollution from stormwater runoff harms or kills aquatic creatures in the creek, and downstream in the Potomac River, the Chesapeake Bay, and the Atlantic Ocean. Decreased groundwater poses challenges for natural communities that have high moisture requirements, such as the Tuliptree Small-Stream Floodplain Forest, the Red Maple Seepage Swamp, and even the upland Basic Mesic Hardwood Forest. Repeated, powerful flash flooding has the potential not only to cause excessive erosion in the Tuliptree Small-Stream Floodplain Forest, but to reach beyond the floodplain and damage the lower fringes of non-flood-tolerant natural communities just upslope—typically the Basic Mesic Hardwood Forest, the Oak - Beech / Heath Forest, or the Mesic Mixed Hardwood Forest at Rock Creek Park. In the 1800s and early 1900s, long stretches of natural waterways in Washington, D.C., were diverted into huge pipes that could be buried to allow the construction of streets and buildings above. Examples are Rock Creek’s eastern tributaries Piney Branch, Fenwick Branch, Portal Branch, and Luzon Branch. Where these tributaries enter Rock Creek Park, their flow returns to open stream channels. During storms, the amount and velocity of water coming from these pipes erodes the open stream channels downstream. The sewer system that was built in the older parts of Washington, D.C., in the 1800s is a combined storm and sanitary sewer.2 In dry weather, sewage flows to a waste treatment plant. During storm events, stormwater runoff enters the same set of pipes. If the flow exceeds the capacity of the system, the excess flow of combined rainwater and sewer spills into streams. The D.C. Water and Sewer Authority is actively working to reduce combined sewer overflows through the D.C. Clean Rivers Project. A series of huge underground tunnels will store sewage during rain events and will reduce sewage overflows into the Anacostia River by 98%.3 The Blue Plains Tunnel and the Anacostia River Tunnel are complete, and work on the Northeast Boundary Tunnel began in 2017.4 Other projects, including surface facilities to divert stormwater and “green infrastructure” will help reduce overflows into the Anacostia, the Potomac, and Rock Creek.5 Green infrastructure refers to practices intended to help more rainwater soak into the ground, including rain gardens, rain barrels, and porous pavement.6 The D.C. Clean Rivers Project is expected to significantly improve water quality, providing improved habitat for organisms living in Rock Creek. Once the waters of Foundry Branch were diverted to flow underground in a large pipe below the old stream channel, natural stream processes in the valley were largely lost, as was valuable habitat for plants and animals. 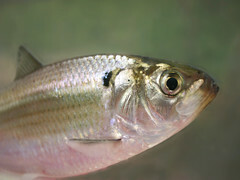 In spring, gizzard shad (Dorosoma cepedianum) may head upstream from their Potomac River home to spawn in Rock Creek and other tributaries. Photographer: Brian GratwickeFish such as blueback herring, shad, and alewives live most of their lives in the ocean, but swim up rivers in the spring to spawn. Historically, all of these fish swam up Rock Creek, but the route has long been blocked by dams, fords, and old sanitary sewer pipes. In 2003-2006, projects at eight of these blockages opened approximately 21 miles of historic migratory fish spawning habitat in Rock Creek and its tributaries. A fish ladder installed at the historic Peirce Mill dam enables fish entering it to swim from level to level to bypass the waterfall created by the dam and continue their journey upstream to miles of additional spawning habitat. In the spring of 2007, alewives, shad, and blueback herring were observed using the fish ladder at Peirce Mill. It was the first time since 1904 that these fish had returned to the upstream waters where their ancestors were born. Map tip: Find this by searching for "fish ladder" on the interactive map of Rock Creek Park. Map tip: Search for "step pools" in the interactive map of Rock Creek Park. Agencies in D.C. are partnering with citizens to reduce the impacts of stormwater runoff on Rock Creek. Some projects offer incentives or ideas to developers and homeowners to make properties more watershed friendly and reducing stormwater flow. Other efforts include educating the public that what they send down their storm drains goes, untreated, straight to the creek. Street and alley cleaning programs, and enforcement of erosion control at construction sites reduce the sediments and pollutants in stormwater runoff. When you’re in Rock Creek Park, you can help protect the natural communities by staying on trails and especially keeping your dog on a leash. This minimizes erosion and the unintentional spread of weed seeds or plant disease. When you’re at home, you can help your nearest stream by keeping oil, paint, and other chemicals and trash out of storm drains, cleaning up after your pet, keeping fertilizer and herbicides off streets and sidewalks, and by planting gardens to soak up rainwater. Ecobit: Is Your Property Watershed Friendly? 1. Carruthers T, Carter S, Florkowski N, Runde J, Dennison B. 2009. Rock Creek Park Natural Resource Condition Assessment. 2. District of Columbia Water and Sewer Authority. 2010. Combined Sewer System. 3. District of Columbia Water and Sewer Authority. 2010. Clean Rivers Project. 4. District of Columbia Water and Sewer Authority. 2017. Northeast Boundary Tunnel Project. 5. District of Columbia Water and Sewer Authority. 2013. Anacostia River Tunnel Project. 6. District of Columbia Water and Sewer Authority. 2017. Rock Creek Green Infrastructure Project A. 7. Yeaman W. 2008. Email communication re: Fish Passage Restoration at Rock Creek Park. Natural Resource Specialist, National Park Service, Rock Creek Park, Washington, DC.